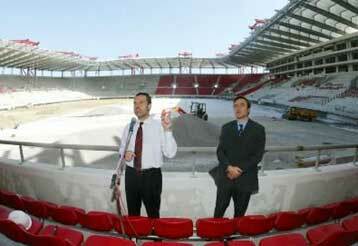 You may discuss here anything regarding the new Karaiskaki Stadium of Olympiacos. See also the relevant thread from the old forum: http://stadia.proboards16.com/index.cgi?board=engstadia&action=display&num=1048137392. It does not look to me like the new Karaiskaki Stadium will be built on time. I went to the Karaiskaki live camera and although they only show a portion of the stadium the part that I saw looked like it had a lot of work to be done. I hope everything will be ready for the Olympics and as an Olympiakos fan I can't wait to go to the new Stadium in person. I also have a question for the Admin. you have seen all the designs of the new stadiums for AEK, Olympiakos, and Panathinaikos so who do you think will have the better stadium when everything is done ? I would like to disagree with you that the Karaiskaki will not get done in time. Although through the cameras it seems as if they are going pretty slow, you have to rember that the upper half of the stadium is nothing but steel and prefabricated concrete stands....So it's just a matter of putting everything together for the top half of the stadium. Now as far as the side of the stadium where the suites and offices are going to be that may come down to the wire...my only worry is if they will have time to put down the grass in the field...the reason I am saying that is because the grass itself takes some time to settle to the ground...see for example other stadiums in Greece which are under construction and they have the grass already on the ground..
As UWG wrote above, Karaiskaki looks like is going to be ready on time. As a matter of fact, works are progressing ahead of the timeschedule. you have seen all the designs of the new stadiums for AEK, Olympiakos, and Panathinaikos so who do you think will have the better stadium when everything is done ? I would never even dare to compare stadia based on plans and drawings, saying "this is better - that is worse". As a matter of fact, I can hardly do that when it comes to existing football grounds! I know this is no answer to your question, but that's just the way I look at things. I have three questions for anyone to answer..
1) Does anyone have any news about the web cam in Karaiskaki????? 2) Has construction started on the bridge connecting the train station with the stadium itself and if so are they close to finishing it???? 3) During the Olympics is the stadium going to have the Olympiakos logos all over the stadium as shown in the models or are they going to wait and add them after the Olympics are over???? This is such a great and historic experience, and we get to see it all unfold. btw, the stadium will be finished on time. I don't think there was ever a question that the stadium would not be done in time....the money is there and the plan is there which is something that is rear for a soccer team to do....I think that they have some kind of filter in front of the lance to block the sun...however its making it kind of difficult to see what’s going on...from what I can see though I am extremely excited.. I can't wait to be there this summer. It is going to be a great experience going to the new Karaiskaki. The webcam has not been working for about 2 weeks now. Does anyone know why it has not been updated? I don't have a clue about what's happening with the web-cam. WOW ! It is really coming along well! I can't wait to go there this summer ! I noticed a lot of progress at Karaiskaki this morning, when I was watching the news on ERT-Sat. They had a report on Orfanos's visit to Karaiskaki Stadium, and showed a lot of the construction moving ahead quite well. Almost done. Nice pic. Is there a date for the stadium to be done? What turmoil are you referring to mate? Please continue this discussion in the "Negative Publicity" thread. It fits perfectly there. The following is video clip from a German news station. Although I don’t know a word of German the video that they show from the construction sites is awesome. Towards the end of the video they show the inside of the Karaiskaki stadium and it seems that they have installed all the chairs on one end of the stadium.